•	The production of the new Audi Q3 model was launched at Audi Hungaria. In the future, electric cars will also be manufactured in Győr. Győr, 20 September 2018—Audi Hungaria celebrates its 25-year anniversary this year. At the anniversary event held on Thursday, Péter Szijjártó, Hungary’s Minister of Foreign Affairs and Trade, Zsolt Borkay, the Mayor of the City of Győr, Bram Schot, Interim Chairman of the Board of Management of AUDI AG and Achim Heinfling, Chairman of the Board of Management of AUDI HUNGARIA Zrt. 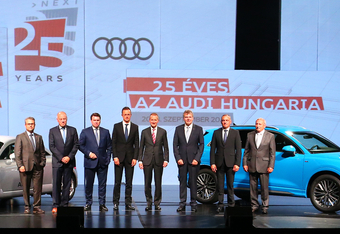 appraised the mutual achievements and highlighted Audi Hungaria’s leading role in the Hungarian automotive industry. This was the first time the new Audi Q3 was introduced to the Hungarian audience. Audi Hungaria was established in 1993; production started with the construction of four-cylinder five-valve engines. In the coming years the company continuously extended its performance spectrum: beside engine construction, vehicle construction was also launched in Győr in 1998, with the legendary Audi TT. Today, 9,000 engines and 700 cars are being manufactured at Audi Hungaria every day, on a floor space of over 5 million m2. Plus, one of the largest tool factories in Central Europe is also situated in Győr. About 400 experts are working on the company’s technical development, on various development projects. Since 1993, Audi Hungaria has manufactured more than 34 million engines and about 1.21 million cars. Currently, there are 12,900 employees working at the company. Through service providers and suppliers, Audi Hungaria provides employment for more than 30,000 people, which makes it the largest employer in the Hungarian automotive industry. In the past 25 years, Audi Hungaria invested more than 8.9 Bn Euros into the Győr production site. The number of Hungarian serial suppliers is increasing year after year: currently, Audi Hungaria is working with more than 90 Hungarian suppliers. The company is preparing for future challenges and is consistently progressing on the road of electromobility and digitalization: the serial production of electric engines was launched in Győr in July. This further extended the engine portfolio of the company: beside continuously developing combustion engines and CNG-engines, now electric engines are also being manufactured in Győr. As a result, Audi Hungaria has become the center of e-engine construction within the Audi Concern in the year of the anniversary. Modular production, a new production concept which was introduced in e-engine production, allows even more flexibility and efficiency. The serial production of the first Győr-made SUV-model was launched a few weeks ago: the new generation of the Audi Q3 is the fifth model in Audi Hungaria’s vehicle production branch. Currently, beside the Audi A3 Limousine and Cabriolet, the Audi TT Coupé and the Roadster, Audi Q3 is also being manufactured on the same assembly line, in full production depth. And next year, the serial production of a new SUV model will start in Győr, which will further strengthen the company’s long-term competitiveness.